Activlab TCM Powder is a top-quality dietary supplement which stimulates anabolic processes in the trained muscles. Creatine malate from this preparation is a well digested form of creatine which is aimed mainly at producing energy in muscle cells. Creatine is a compound which is synthesised mainly in the liver, the laboratory of our body. It consists of three amino acids, including glycine, arginine and methionine. It is transported through the blood into different parts of the body, mainly tissues with high metabolic requirements – muscles and nerve cells. Individuals doing strength sports have a high demand for this tripeptide which may be thus not satisifed by biosynthesis only. Creatine taken orally is highly bioavailable and its form used in this supplement is not coincidental. Creatine malate (TCM, tri-creatine malate) features excellent bioavailability without side effects such as water retention. What is more, its anion constituent (malic acid) is a substrate for metabolic pathways and that is why it provides even more energy for the working tissues. Cells need energy from metabolic processes in order to function. It is carried by the compound abbreviated as ATP (adenosine-5’-triphosphate) – an unstable molecule which cannot be stored. To remove this limitation, the body synthesises high-energy phosphates, including phosphocreatine. During hard exercise (e.g. during strength training), it functions as a “quick fuel” which allows you to do extra two reps. Owing to that, it is possible to preserve muscle glycogen stores and inhibit the production of lactic acid which causes a feeling of fatigue and decreases your training performance by building up in cells. Apart from an increase in intracellular ATP levels in muscles, creatine has been shown to contribute indirectly to muscle hypertrophy. This is because it inhibits the activity of the protein myostatin. It is responsible for physiological inhibition of muscle mass growth. This makes the building of muscle mass without supplementation much more difficult for individuals doing hard strength training. What is more, this anabolic tripeptide helps increase the density of muscle fibres by activating the MAPK and ERK cascades. As a result, it stimulates processes of biosynthesis and inhibits protein catabolism, thereby creating a positive nitrogen balance. Creatine has also a positive impact on different parts of the central nervous system. Since neurons have the highest energy demand in our body, they are relatively rich in creatine. A serious problem in the CNS is excessive excitotoxicity of glutamate – a neurotransmitter which induces the influx of calcium ions to nerve cells and thus leads to their damage. ATP prevents the overaccumulation of intracellular calcium. As a result, creatine supplementation may contribute indirectly to maintaining ion homeostasis and reduce toxic effects of excessive glutamate release. Creatine has been also shown to influence beneficially mental performance. It may be a promising agent which helps treat depression (it may improve the efficacy of SSRIs). Since it supports mitochondrial function, it may aid in maintaining healthy energy metabolism, which has a very big impact on well-being. 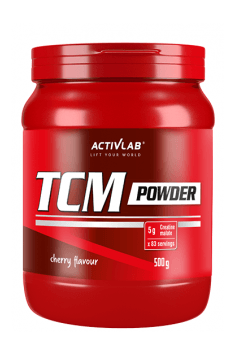 To sum up, Activlab TCM Powder is a high-quality dietary supplement designed for every novice at strength athletics who want to do their best at workouts and take great satisfaction from them. Dobry smak (cytryna, pomarańcza), dobrze działa, dobrze się rozpuszcza, dobra cena w stosunku do ilości. Moim zdaniem bdb produkt. Dissolve 6 g (1 teaspoonful) in 250 ml of water. Take once a day, 30 minutes before training. Take 1 portion at any time during the day. Creatine is an amazing substance whose anabolic effects are backed by many scientific studies. We recommend the supplement especially to individuals who want to overcome their limitations in increasing muscle mass and strength. It can be a good idea to supplement with whey protein which will allow you to provide a good quality, quickly digested building block for muscles. Acidity regulator - sodium citrate, flavors, sweetener E951, anti-caking agent E551, coloring: E104 (lemon flavor), E110 (orange, grapefruit and kiwi flavor), E124 (grapefruit, cherry and blackcurrant) - may have harmful effect on activity and attention in children, E160a (orange flavor), E133 (taste of kiwi and blackcurrant).